This ancient oral story tells the tale of the great warrior Beowulf, kinsman to King Hygelac, and his magnificent ascent to glory and eventual descent into honorable death. In chapter one, Beowulf sails across the sea to save King Hrothgar and his people from the terrible beast Grendel, who ascends upon the King’s great hall every eve to destroy any that dwell there. Beowulf greets Grendel in the great hall sans his sword and shield – bare-chested – prepared for glory and death. Grendel tears Beowulf’s men apart, their spears and swords crumbling and breaking over his black hide. Beowulf meets beast and bloody battle ensues, ending with Grendel escaping with barely his life and missing a limb. In chapter two, Beowulf follows Grendel to his mother’s lair beneath the waters of the moor, seeking the heads of both Grendel and his ghastly parent. In that den he picks up a great-sword and he destroys them both and takes Grendel’s head back to King Hrothgar, along with the ancient family sword. Because of his deeds, Beowulf is rewarded and ruled his own land for many years until a great red dragon appeared. When a slave steals a cup from the dragon’s hoard, the beast takes retribution against the people, burning all in his path. So Beowulf, in his twilight years, dons his sword and shield to do battle once more. His warriors, in fear, run from the red dragon, save one who stands with Beowulf. Together they destroy the reptile, but in the process Beowulf is fatally wounded. After the battle, awaiting death, he takes solace in the fact that his old kinsman and warrior friends have all already passed and that his time, too, has come. Because of his deeds the people of Geatland built unto him a burial tower to honor their fallen hero-King. The dragon’s treasure is buried with him. Hinds does a magnificent job melding art and word into one comprehensive yet artistic piece of literature. Each chapter in the story is illustrated differently, creating a unique feel for each story arc. The story is bloody, with heads being severed and bodies being impaled and ripped apart. Yet, somehow Hines manages to keep the gruesomeness to a minimum. The images speak volumes and add much to the written word. In fact, there are significant portions of the story that are told exclusively through illustration. This is especially true in the fight scenes and during the set-up for chapter three when we learn that a slave steals a cup from the dragon, sparking rage and bloodshed on the entire people. This particular episode in chapter three is a bit cumbersome as the reader is required to either have previous knowledge of the story or to then seek out other sources in order to interpret the story. The lack of certain details is the only thing holding this book back. Readers will undoubtedly be interested in the fact that Grendel is not just a product of an “accursed race” but that he is actually a descendant of the biblical character, Cain, from whom all manner of earthly monster is born, according to this tale. The choice for leaving out the narrative during the introduction of the dragon and for leaving out the reference to Cain was deliberate on the part of Hinds, and while I understand the decision I think it takes away from the story. In the end, these are minor details when considering the whole of the book and the beauty of the storytelling. Rating this graphic novel has left me in something of a quandary. There is quite a discrepancy between the reading level and the interest level, in my opinion. The language is more suitable for a teen, yet the interest level is much lower. In the end, I have opted to rate this title starting at age 10, even though it does have some fantasy, human-on-monster violence. Ultimately, this is a title that should be recommended to children on an individual basis and open to all 12 and older. This does have some fantasy, human-on-monster violence, including the severing of heads and limbs. So much could be done with a piece like this. A high school class could discuss the religious implications of the literature in relation to the time it was created. How did the literature affect later cultures and religious beliefs? Students could also discuss the different translations and the movie adaptation and compare and contrast those pieces. One could also study BEOWULF as a catalyst for the modern English mythology. How has BEOWULF influenced other pieces of literature, namely J.R.R. Tolkien’s world? 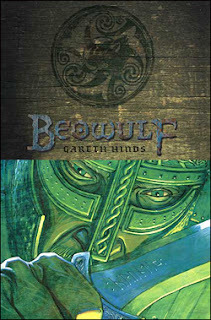 Younger students could use BEOWULF as a way to help them develop their own mythologies. Hinds originally published BEOWULF as a three-comic series using an older translation by Francis Gummere. Then he collected the issues and republished as a paperback graphic novel. Candlewick Press then took Hinds’ book, used a more modern translation by AJ Church, and republished in both paperback and hardcover. Hinds original art remains intact in all editions and all of the editions are available on Hinds’ website. Considering the implications of BEOWULF on modern literature and culture, this is an important piece to study. The graphic novel offers the reader an interesting look into the mythology and makes it accessible to a new group of young people. Hinds’ work is expressive and poetic and worthy for the classroom.